Born at Chipstead in about 1879, the son of Thomas, a farm labourer, and his wife Sarah. In 1901 he was working on a farm as a teamster and was still living at his parent’s home in Mugswell. In 1910 he married Ethel Marry Potter, who came from Dorking. At the time of the 1911 census they were living in Mill Lane with 4 children whose ages ranged from 11 to 3 months. The three oldest children had the surname Potter, but were described as being sons or daughters of the head of the household (William Waite). The youngest child did have the surname Waite. Ethel or Ellen was probably the daughter of an agricultural labourer living at Laurel Cottage Holmwood, she does not appear to have been married before. 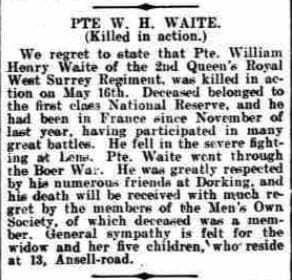 He enlisted in the 2nd Battalion at Croydon and was killed at Festubert on 16 May 1915 and commemorated at the Le Touret Memorial. Although Festubert is not one of the main battles in the war the 2nd Battalion of the Queens Own Regiment was heavily involved and therefore there is a high attrition rate amongst men from Surrey and the Dorking area. Over 16,000 men were killed between 15 and 27th May 1915.